I need to watch this series, if only for the costumes alone...simply gorgeous! 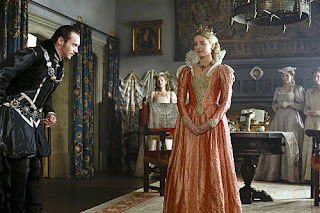 Click here to see some more pictures from Season 3 of the Tudors which starts April 5th. All these versions of the Tudors... gets kind of confusing. Margaret George portrayed Anne and a very very naughty woman... The Showtime series doesn't portray her as "that" bad.. He is so good looking. What are they going to do when his character gets all fat with a lame leg? Hee hee. I completely agree! If Henry would have been that hot & if I had been alive then I probably would have lost my head too! I watched the 1st episode already and Jane is mousie, she already seemed scared of him. I also have wondered about how they are going to make him heavy, but they did start to show his leg hurting in the 1st episode of 3 season. 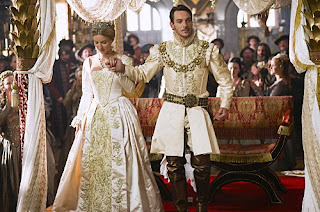 LOVE THE TUDORS!!! Yes, isn't he gorgeous? I pay extra to get showtime, just so I can see it! It's basically a soap opera with gorgeous costumes and scenary. One show and you'll be hooked girl!